Entrepreneurs in the Democratic Republic of the Congo are stepping up to break down barriers caused by a lack of technology infrastructure. It’s an early Saturday morning in Kinshasa, and Rose Sesebe, a local college student studying computer science, is gathered with about 20 other software developers outside of a downtown business hall. The doors aren’t yet open, but participants have arrived early in anticipation of the Kinshasa Hackathon, a 48-hour weekend computer programming competition, the first of its kind ever organized in the country. They’ve all entered the competition in order to pose and build solutions for some of their country’s greatest problems. Rose and her four teammates entered out of an interest to build an application that helps other college students like themselves, as well as the unemployed, find jobs. As soon as the organizers unlock the entrance, they plan on rushing to their coding stations to begin coding. At 8 a.m., the door finally opens and 98 developers organized in 24 teams flow in to begin the process of building – from healthcare and safety to transportation, sanitation, and finance, their ideas are vast. At stake is $4,000 USD in cash awards and other sponsored prizes for the most impactful ideas. One of the non-cash prizes: a coveted, all-expenses-paid trip to Lisbon, Portugal to present at the 2016 Web Summit, Europe’s largest technology conference. To say the least, these engineers are on the cutting edge of innovation and their work could propel their country into the 21st Century. When people think about the Democratic Republic of the Congo (DRC), they often think about its abundant natural resources, the musical influence the nation has had on the rest of the African continent, or the war conflict the country faced at the turn of the century. Growing Congolese interest in technology is not often top of mind; and yet, technology is just the sector that has the potential to transform the Congolese economy. From agriculture and transportation to finance and communications, every industry in the DRC is affected by the lack of technology infrastructure. Rural farmers and port traders are unable to get their fruits and crops to market due to limited communications with riverboat operators who connect producers with sellers. Most businesses, big and small, lack a digital presence through a website, which makes it difficult for them to sell their goods and services to large audiences, nationally or internationally. Living in a cash-based economy, too, where most people do not have bank accounts, debit cards, or credit cards, makes doing business difficult at a basic level. Technology infrastructure has the power to take the DRC to new heights – to democratize education, to grow industries, to end poverty and hunger. The DRC, particularly the capital city of Kinshasa, is ripe for innovation today. The talent exists, but has yet to be discovered and fully utilized. A growing number of entrepreneurial support organizations are taking root to help innovators and problem solvers bring their ideas to life, and the roster of successful Congolese entrepreneurs continues to grow. Now is the time to invest and build the infrastructure that will enable innovation. Just this year, the DRC Ministry of Industry launched the Innovation Award, which honors inventors and entrepreneurs. With $800,000 available to winners, the prize awards entrepreneurs like Flech Tech CEO Dieudonné Kayembe, one of its first recipients and inventor of the Motema Tab, a Congolese-produced mobile tablet. The country doesn’t have a shortage of home-grown innovators, such as founder and CEO Benedict Mundele of food manufacturer and processor Surprise Tropicale, and mobile app developer and designer Carlo Lekea, founder of tech firm Idea IT & Conception. We just don’t hear about these entrepreneurs often; that has to change. When Sam Yongo, a Congolese US-educated software developer, now iBurst DRC President and Chairman, relocates to the Congo to build App Corner, a curation platform for apps built by local Kinshasa developers, we need to know about and support that. When EXP Agency Country Manager Patricia Nzolantima is growing the magazine she founded, “International Working Lady,” we need to know about and support that. Innovation isn’t new in the Congo – it’s just not well publicized. From the growing number of technology innovation and co-working spaces in Kinshasa – including Congo iHub, Lumumba Lab, and the Mwasi Tech Hub that’s specific to women entrepreneurs – to the international development programs enhancing Congolese innovation and entrepreneurship – such as the U.S. Department of State’s Young African Leaders Initiative, as well as ÉLAN RDC, a program financed by Adam Smith International, on behalf of the British Department for International Development – much has been developed to build a platform for innovation and economic enhancement. Now is the time to build upon that base. 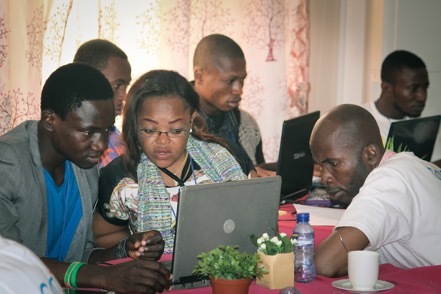 We go back to the Kinshasa Hackathon. It’s Sunday evening, and all 24 teams of web developers are preparing to present their demos – not a single team or individual participant has dropped out. Focused on the judging criteria, including originality, economic impact, and accessibility, these problem-solvers are hungry for the change they know they can create. Developers behind the “Mama” app for expecting mothers won the “Gender Equality Award” at Kinshasa Hackathon for the app’s potential to make a positive impact on the lives of Congolese women. The first app presented is focused on vaccination logistics. Another hopes to enable mobility-impaired people to control household technologies, such as lights and cooking appliances, via SMS texting. The audience of local business, non-profit, and government leaders are surprised and impressed by the sophistication of the product demos. Jody Nkashama, a host from the largest DRC radio station Radio Okapi, with 23 million daily listeners, bobs around the room, interviewing developers and organizers. The energy is ecstatic as judges go off to determine the winners who will be announced the following evening. The grand prize is awarded to the team behind Bomoyi (meaning “life” in Lingala), an SMS-based application that would enable the Ministry of Health to track and coordinate the national supply of vaccinations across the entire country. Mama (meaning “mother” in Swahili) wins another prize – the app helps doctors coordinate and keep track of appointments with pregnant patients, while reminding expecting mothers about appointments via SMS. Another prize went to Wasafi (meaning “clean” in Swahili), a city-level garbage collection, recycling, and logistics app. These are just three of the 24 ideas that came to life at the event, and the August hackathon was only the first of many entrepreneurial support initiatives co-organizers Congo iHub, ÉLAN RDC and IMA World Health, and have in the works. Lack of technology infrastructure may be a constraint for economic development in the Democratic Republic of the Congo for now, but if software developers and budding entrepreneurs in Kinshasa have anything to say about it, technology will bring the change its people seek. As a Congolese software developer and entrepreneur myself, I believe that technology will transform our country. I now live in the United States but was a co-organizer of the Kinshasa Hackathon, because I want to give back to my country and give to young Congolese developers and entrepreneur something I didn’t have when I was in their shoes: An opportunity to express their creativity. Dan Ndombe is a technology entrepreneur, software developer, YouTube personality and founder of US-based software development firm DevSprout. Through his work as a consultant with ÉLAN RDC, a DFID funded programme implemented by Adam Smith International, Ndombe is focused on making a difference in his home country, the Democratic Republic of the Congo.